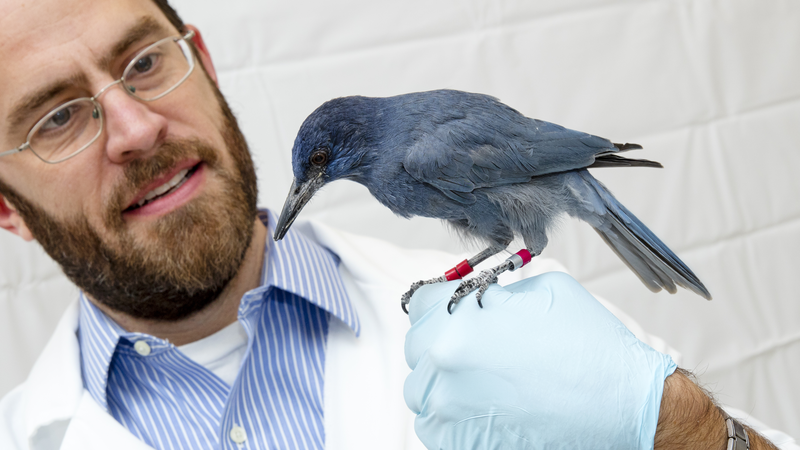 A pinyon jay perches on the hand of Jeffrey Stevens, associate professor at the University of Nebraska-Lincoln. Stevens and doctoral advisee Juan Duque have shown that a hormone called mesotocin may contribute to the food sharing and other prosocial behaviors that pinyon jays exhibit in the wild. A new study from the University of Nebraska-Lincoln has shown that it’s possible to feed two birds with one hormone. The hormone, mesotocin, has a closely related cousin — oxytocin — that decades of research suggests can promote prosocial behavior in mammals: stronger affiliations among dogs, greater acts of charity among humans. Nebraska researchers Juan Duque and Jeffrey Stevens set out to determine whether mesotocin could do the same for birds — specifically pinyon jays, a highly social species known to share food with one another in the wild. After giving pinyon jays a high dose of mesotocin in the lab, Duque and Stevens found that food sharing among the birds rose by nearly 32 percent. That compared with a 12-percent rise when administering a lower dose. “We’re seeing a very similar (prosocial) effect using a slightly different molecule, which points to the fact that this is a really important hormone that has effects across a large range of species,” said Stevens, associate professor of biological sciences and psychology. To assess the effects of mesotocin, the team set up three adjacent cages. 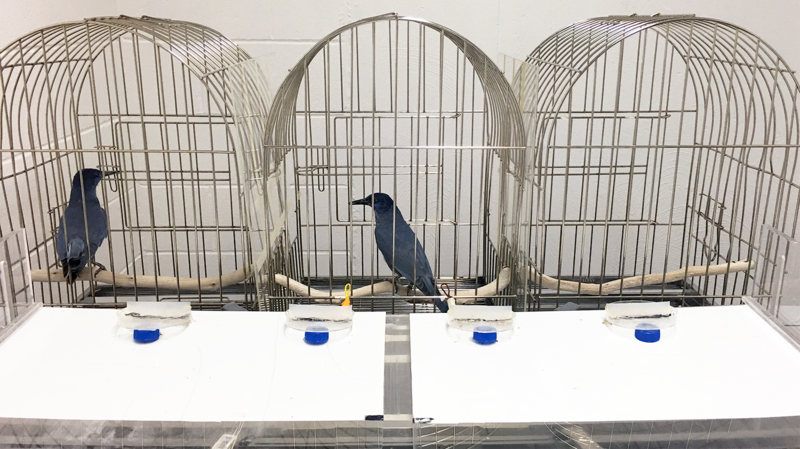 The pinyon jay being tested in a given experiment was placed in the center cage, with a neighboring jay put in either the left or right cage. After being trained, the center jay could choose to peck one of two wires — one slightly to the left, one to the right — that were respectively connected to a left and right tray outside of the cages. Each tray held two food dishes, which were positioned so that the two centermost dishes sat in front of the center cage and the outermost dishes faced the left and right cages, respectively. When a center jay pecked the left or right wire, the researchers pushed forward the corresponding tray, giving the jays access to those dishes. Two pinyon jays perch in cages as part of an experiment conducted by Nebraska's Juan Duque and Jeffrey Stevens. In one experiment, the team filled all four dishes with a mealworm. The center jay received a worm no matter which tray it chose, but that choice also determined whether a second worm went to the neighboring jay or an empty cage, making it a test of prosocial behavior. The team also evaluated altruistic behavior by placing mealworms only in the outermost dishes, meaning that the center jay could deliver a worm to either its neighbor or an empty cage — but received no worm for itself in either case. Under those conditions, Duque and Stevens found that the center jays did not care whether they delivered food to their neighbor or the empty cage, and even a large dose of mesotocin failed to spur a meaningful rise in this altruism. But by establishing a link between the hormone and generosity, Duque said, the study could accelerate experimental research on prosocial behavior beyond the realm of primates and other mammals. 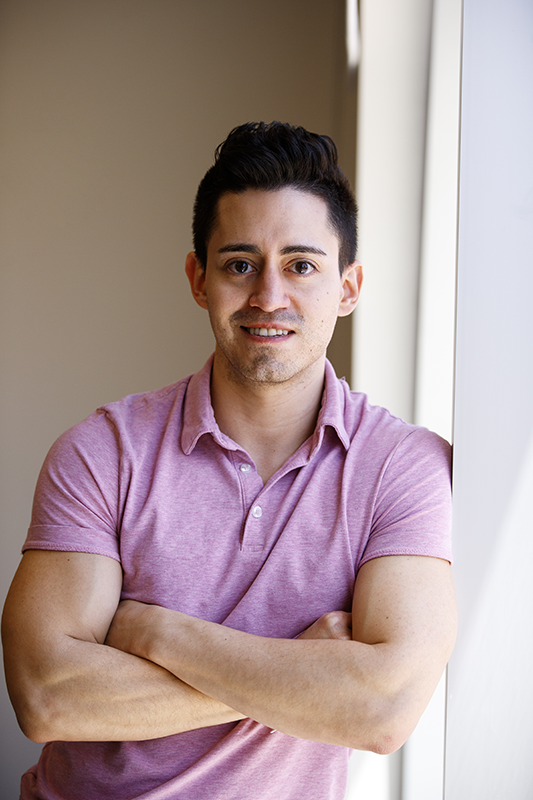 “Birds are much more feasible to work with in many circumstances, and you have access to many more species that vary along the sociality spectrum (and) show varying evidence of prosocial behaviors,” said Duque, a doctoral student in psychology. “I think there’s an opportunity to run wild with it. Duque and Stevens authored the study with Nebraska alumnae Whitney Leichner and Holly Ahmann, former undergraduate members of Stevens’ Adaptive Decision-Making Lab. The team reported its findings in the journal Biology Letters and received support from the National Science Foundation.